I've seen several old (1+ year) discussions and bug reports about this, and it looks like this was supposed to have been fixed in 5.1. However, I'm still seeing the behavior in 5.3.1 when I profile an IIS application. Is there something I'm missing? I think you use 64-bit mode in your IIS7. Could you check that you haven't got the following warning in the controller window: "Failed to apply patch for CLR vX.0 x64"? I redesigned the patcher in dotTrace 6.0 to make it universal. Now we have a discusion to include new patcher into dotTrace 5.X. 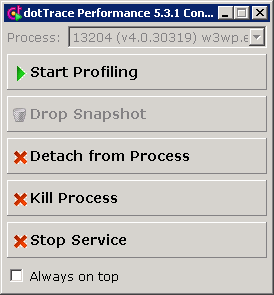 The initial progress window that briefly comes up flashes a bunch of steps, including something about profiler cores, but I don't think I see any error or warning messages there. Is there a log file I can look at? That's great! Could you please send me core logs? 10. send content of %Temp%/JetLogs to me. Have this problem been resolved? I'm running an evaluation copy of the product and I'm experiencing the same issues as Steven. I don't exclude that the issue is still presented in some computer configuration because MS generates updates for OS, CLR, IIS, ... So, I always ready to investigate the every new problem. Are you ready to help me? Could you please send me core logs in that case (see the instruction above)? Thank you for logs. You have warning: "Failed to apply patch for CLR v4.0 x64". It means that our patcher detect incompatible CLR version. I already have the fix (for dotTrace 6.0). However, I need one-two days to approve it for dotTrace v5.3.1. Can I help do resolve this issue? Hello Geoffrey, please contact me (alexandra.rudenko@jetbrains.com), and I'll send you a custom build with the fix. I'm also seeing a similar issue with the current evaluation version, has this problem been rectified, or is it still present? 100% "Native or optimized code" for all managed threads is correct for some usage scenario (attach to w3wp.exe and immediately get snapshot) because IIS is native application which sometimes calls managed code. So, please add some activity into your scenario and you see managed code in snapshot. I belive that the last dotTrace works perfectly because the last issue was solved a month ago for v5.3.2. However, I'm ready to investigate your problem if you have a time. Ah right, looks like I am using 5.3.1, so that may well be the cause of the problem. Is 5.3.2 available for download anywhere? I sent the link to you by mail.